Jeera pulao is basically rice flavoured with cumin and lightly spiced with whole garam masala. Just to make it healthy I used bulgur wheat instead of rice and spiced up with green chilli and pepper as a variation. 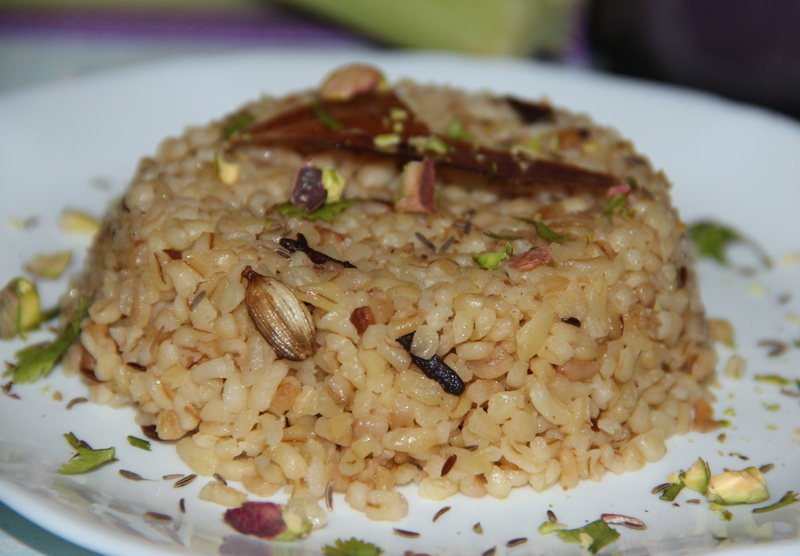 Jeera pulao perfectly complements a well made dal or a vegetable curry. Bulgur is what’s left after wheat kernels have been steamed, dried, and crushed. Bulgur makes a healthy and quick addition to any meal because it’s 100 percent whole wheat that’s specially prepared to decrease cooking time. It’s a good source of fiber, protein, iron and vitamin B-6. One thing to keep in mind, a cup of bulgur has fewer calories, less fat, and more than twice the fiber of brown rice. • Wash and soak bulgur in enough water for 30mins, drain water and keep aside. • Combine green chilli, garlic, pepper corns, cumin seeds and ground it to coarse. • Heat oil in a sauce pan add bay leaf, shahi jeera , ground masala , clove, cinnamon, star anise and saute for 2-3mins. • Add in drained bulgur and fry for 3-4mins. • Garnish with coriander and serve with dal/ any side dish of your choice. • If you have less time to soak bulgur can cook directly by adding 1:2 ratio bulgur:water. As I had soaked before cooking added less amount of water. • Bulgur is similar to brown rice but it takes less time to cook. • You can use brown rice/ white rice instead. • You can even use ghee for sauting it gives nice aroma to the dish. Posted on November 18, 2014, in Indian, Main dish and tagged Bulgur Indian recipe, Bulgur wheat, Bulgur wheat recipe, Cumin, drchdietfood, indianrecipe, Jeera Bulgur rice, Jeera rice low calorie. Bookmark the permalink. 8 Comments. thanks for introducing bulgur in a form that rice is usually eaten. I did not know it was more nutritious than brown rice. Thank you. Makes me feel happy that you liked the recipe. First off, this sounds amazing! The health benefits of Bulgar are good as well. If you cannot have wheat, substitute a whole grain of your choosing. I believe quinoa would work nicely. A word of caution though. The aroma of these spices will increase the traffic flow in your kitchen. Have the first person that walks in to see what is cooking, set the the table while you smile. Thank you Chitra for this healthy addition. Thanks Bob for your continued support..